Personalized Marketing: How Personal Is Too Personal? You’re aware that personalized content has the power to capture your audience better than any other online medium. The smarter we get with technology, the more we can learn from our target audience and engage them on an intimate level - but how intimate should marketers get? No matter how innocuous your personalized advertisement may seem, it’s wise not to overestimate consumers’ willingness to trust your company with their private data. According to Pew Research, 86% of internet users have taken steps to remove or mask their digital footprint. If your ad comes across the right way, they are less likely to take offense. When brands misuse their customers' data, the act sticks out like a sore thumb. While many are apprehensive when it comes to companies sending targeted ads, over the last 10 years viewers have grown accustomed to seeing retargeted and personalized ads online. There is a line, and many marketers today are still learning where it should be drawn. However, fortunately for you, we have some surefire ways to avoid your personalized content coming off as “creepy”. Here’s a recent example of a company getting a little controversial with the way they used their customers' intimate information. We all have our own guilty pleasure movies. You know those movies that you don’t want anyone else to know you secretly love? 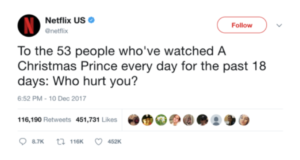 Netflix took the feeling of shame and embarrassment most have with their guilty pleasure movies and used it to create a tweet that divided their audience. Our Take: What was intended as a cheeky joke ended up dividing a large segment of Netflix’s followers. 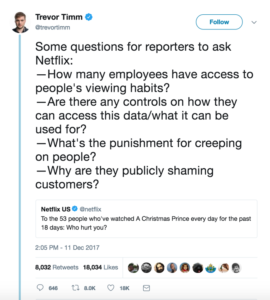 Customers know Netflix has access to their personal viewing data, but it’s not necessarily the best thing to be reminded about. The mocking of Netflix’s own consumers can easily be taken with offense. So how do we connect with our audience on a personal level…without getting too personal? There are several ways you can leverage your consumers' personal information without giving them the impression that “evil Big Brother” is monitoring their every move. The old adage “It’s better to ask for forgiveness than permission” may not apply here. Indicating from the outset exactly how you intend to use your customers' data can go a long way in building a strong, trusting relationship in the future. 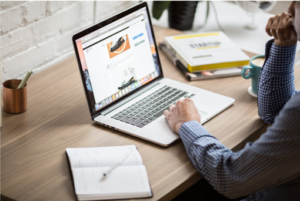 If you are able to successfully demonstrate the exchange of value your customer enjoys when submitting personal information, they will be more likely to open up and provide additional detail. See how this personalized video encourages viewers to provide accurate data so they can redefine their personal savings goals. This is a great example of a give and take. We learn more about the customer, so we can provide the best recommendations tailored specifically to their needs. Training your employees on the regulatory and corporate rules regarding use of customer data is essential. There can still be a lot of assumptions made by marketers when it comes to the right and wrong way of using customer’s personal information. All it takes is one employee’s mistake or misjudgement for a large group of your customers to lose trust in your brand. Just see the Netflix example above. There are certain places where personalized content makes a lot of sense. A loyalty program, for example, is where consumers should expect retailers to send custom offers based on their interests and spending behaviour. We can help you determine what other moments in your sales funnel can benefit from personalization. For more insight into how you create better leads with personalized content marketing, stay tuned to the BlueRush Blog and see how IndiVideo can help create amazing personalized videos for your team. Len has over 25 years of experience in visual communications and strategy. Over the last decade his focus has been primarily in the digital area. Specializing in corporate communications, Len founded one of Canada's most successful production companies. His company created leading edge video production, TV commercials, digital strategy and media. In 2006, Len and Larry formed a partnership to create a new BlueRush with the intent of creating personalized customer experiences using a unique blend of digital media and deep technology capabilities. BlueRush works with clients in the financial services, healthcare and packaged goods industries leveraging current digital technologies and services, creating great user experiences at all points in the customer journey.